Scion - Packaging Council of New Zealand Inc.
New Zealand could build a renewable low-carbon transport fuels industry - but only if the nation decides to act. A report by Crown Research Institute Scion outlines how the country could grow, process feedstock crops into green fuels particularly aimed at the heavy transport, shipping and aviation industries. “We initiated our own study to inform and stimulate debate on the large-scale production and use of liquid biofuels in New Zealand,” says Paul Bennett, Scion Science Leader Clean Technologies. Scion undertook extensive stakeholder discussions, and modified a computer model (Bioenergy Value Chain Model (developed by the Energy Technologies Institute, UK) to create scenarios of what crops and processing facilities would be needed to produce different quantities of transport fuel sustainability. This modelling of fossil fuel replacement with biofuel equivalents ranged from 5% to 50% substitution. With combustion of liquid fossil fuels in 2015 representing about 23% of New Zealand’s domestic greenhouse gas emissions, biofuels could have a major impact on overall lowering of carbon emissions. The modelling tool is available for more quantitative scenarios, based on what Scion hopes is an informed deliberation, planned strategy and long-term implementation to manufacture green fuels within New Zealand. 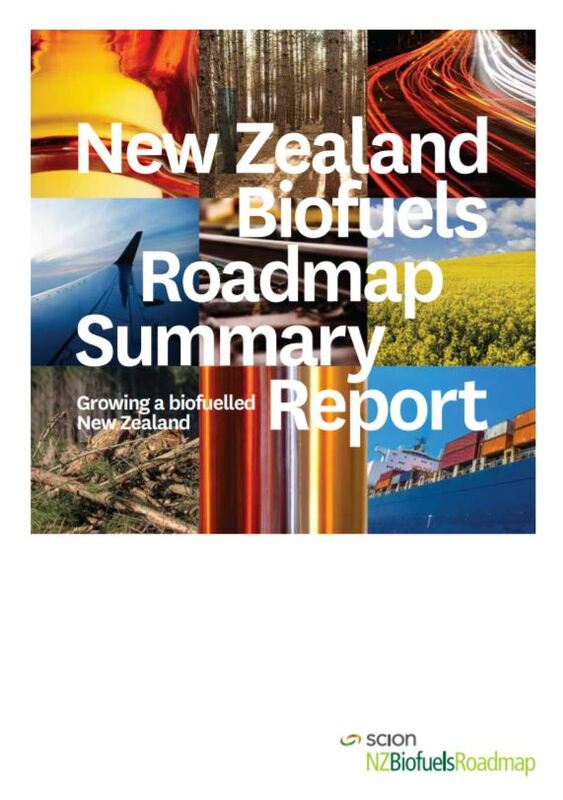 The study findings, presented in the New Zealand Biofuels Roadmap Summary Report, shows drop-in fuels from non-food feedstocks, particularly forestry grown on non-arable land, is the most attractive option. This form of biofuel production would also provide strong regional development and employment growth in regions such as Northland, East Coast and the central North Island. “However, both our modelling and stakeholder discussions are explicitly clear that market forces alone will not be sufficient to kick start large-scale biofuel production,” says Paul Bennett. ● Maintain access to international markets for our goods and services. Scion’s modelling shows that by growing longer-term crops, such as energy forests, New Zealand could build a biofuelled future. The quantitative scenario modelling clearly shows tens of thousands of hectares of purpose-grown feedstock crops and billions of dollars of capital investment in processing plant construction and production would be needed to make an ideal a reality. Scion is the lead CRI for research into bioenergy production for New Zealand, and CEO Dr Julian Elder says the study was undertaken to investigate what liquid biofuel options are best suited to New Zealand. The Biofuels Roadmap is a considered and thorough piece of work which shows why and how New Zealand can transition to a low-carbon transport fuel future says Z Energy Chief Executive Mike Bennetts. “All the pieces required for our country to transition aren’t crystal clear, but this study shows we have enough of a biofuels four-lane highway for us to start driving down,” he says. “Naturally, it wouldn’t be easy, nor quick to develop a green, renewable liquid transport fuels industry,” says Paul Bennett. The two-year study was supported by Scion’s Strategic Science Investment Fund from the Ministry of Business, Innovation and Employment.